Georgi Kinkladze played a full 90 minutes in Leeds United's 2-0 reserve win over Wolverhampton Wanderers. Kinkladze has been on trial with cash-strapped Leeds for 10 days and received international clearance to play. "He did quite well and showed some of the touches of old," said Steve Agnew, reserve team coach. Leeds won through goals from Paul Keegan, just before half-time, and Michael Bridges, moments before the final whistle. Kinkladze played just behind Bridges in midfield in a comfortable win. "It was a very heavy pitch which tired the players quite a bit and it was difficult for them to play football on," Agnew said. "But I kept in touch with Georgi throughout the game and he didn't want to come off, he just wanted to get the full 90 minutes under his belt. "He's a magician with the ball at his feet, it's now a case of stepping up his fitness levels and taking it from there - maybe he has a chance. The Georgian international has been without a club since leaving Derby in June 2003. Manchester City first unleashed the mercurial Kinkladze on English football when they signed him from Dinamo Tblisi in August 1995 for £2m. The little Georgian's skills made him a cult figure at Maine Road but after three years at City he moved to Ajax in August 1998 in a £5m. He returned to English football, initially on loan, with Derby after just a year in Dutch football. In April 2000, Derby made the loan permanent by paying Ajax £3m for his services. 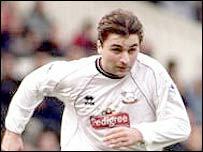 Kinkladze was unable to keep the Rams in the Premiership and he left Pride Park in June 2003 after failing to agree terms on a new contract. Since then, he has trained with a number of clubs in an attempt to get back into English football. Cash-strapped Leeds are desperate to inject some fresh blood into their depleted ranks and the 30-year-old would not cost them a fee.